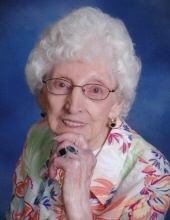 Bertha A. Leja, age 103, of Cornell, passed away at 7:17 P.M. on Thursday, January 17, 2019 at the Cornell Area Care Center with family by her side. Bertha was born April 3rd, 1915 the daughter of Charles and Mathie Saheim in Stanley, WI. She grew up and attended school in the Brownville area, north of Stanley. Bertha Saheim was united in marriage the summer of 1936 to Frank Joseph Leja in Chippewa Falls and together they had 2 children: Corrine and Elroy. She worked at the Stanley Corp. for several years and then was a cook at the root beer stand and Decker's Inn. Bertha enjoyed sewing for her grandchildren, playing cards, spending time with family, and always made sure her company was well fed and there was plenty of pie. She is also survived by her step grandchildren – Joe (Shirley) Randall, step great grandchildren – Jesse Randall and Addy; and 1 step great great grandchild. A funeral service will be held at 11:00 A.M. on Thursday, January 24, 2019 at St. John’s Lutheran Church in Cornell, WI. Interment will be at the Stanley Cemetery. Visitation will be held from 9:30 A.M. until the time of service on Thursday at the church. To send flowers or a remembrance gift to the family of Bertha A. Leja, please visit our Tribute Store. "Email Address" would like to share the life celebration of Bertha A. Leja. Click on the "link" to go to share a favorite memory or leave a condolence message for the family.